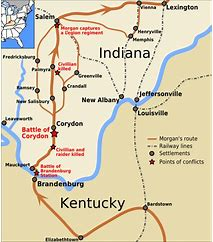 Battle of Corydon – Mr. John Jennings, Indiana’s 1st Governor, in period dress will be our step on guide for our special guided tour of Corydon and the Battle of Corydon, the only Civil War battle fought on Indiana soil. In hopes reinforcements would arrive and stop Confederate General John Hunt Morgan’s march through Southern Indiana, 450 members of the Harrison County Home Guard attempted to delay Morgan’s 2,400 Confederate soldiers and a battle ensued. Enjoy an included lunch at a local favorite. The Carnegie Center for Art and History, New Albany – Underground Railroad Exhibit: Ordinary People, Extraordinary Courage: Men and Women of the Underground Railroad draws the national phenomenon of the Underground Railroad into sharp focus by revealing the contributions of ordinary people, both free and enslaved, whose courageous acts on both sides of the Ohio River helped overthrow the institution of slavery. For two and a half centuries, slavery was a blight on our nation’s psyche. Through it all, more and more ordinary people acted in the face of human tragedy and changed America forever. Town Clock Church – Completed in 1852, this truly significant structure is connected to the Underground Railroad in the metro area. The building served as a beacon of hope to freedom seekers across the river. It was a connecting point between cities in a slave and free state, and a safe haven in a hostile environment on a long journey to freedom. Division Street School – Post Civil War, African Americans strived to become full participants in society. In 1869, the Indiana General Assembly passed legislation encouraging local school districts to provide black communities with free public schools. Division Street School is one of hundreds of black schools built in the wake of the new law. Today, Division Street School serves as a museum of African American life and education in New Albany.